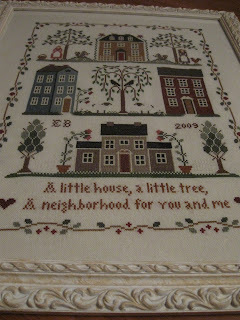 Little House Neighborhood SAL: Finished and framed! Congratulations! It's really lovely and the frame is perfect!! Congratulations on the great finish. Your choice of frame is fabulous!!! I agree with Nicole it's very elegant. THANK YOU ALL FOR THE COMPLIMENTS!!!!!!!!!!!!!!! Oh how beautiful! LOVE the frame! 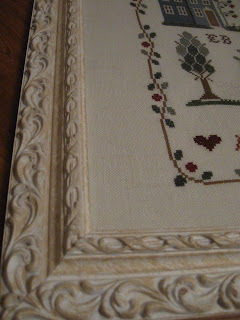 Love your finished SAL the framed piece will look good in your bedroom. Congratulations. FABULOUS! Congratulations! I'm green with envy! Great frame as well!